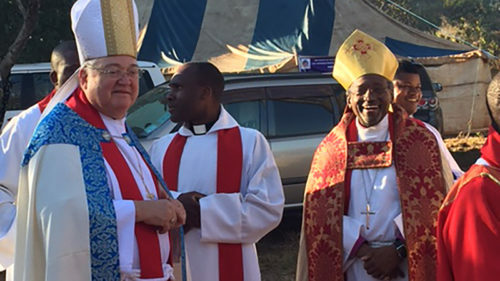 [Episcopal News Service] Presiding Bishop Michael Curry traveled this month to Zimbabwe to attend an annual festival for the martyred 19th century missionary Bernard Mizeki and delivered a sermon there to more than 15,000 pilgrims from across Central and Southern Africa. “I had hoped that that crowd would fire him up and he in turn would fire them up, and that’s what happened,” Lambert told the Episcopal News Service by phone. Curry spoke of the Jesus Movement, one of his recurring themes as presiding bishop, and he emphasized Matthew’s account of the Great Commission, saying “go, therefore, and make disciples of all nations.” The repetition of that passage in Curry’s sermon eventually prompted to the crowd to respond by chanting “Go!” over and over. “The energy was palpable, and the depth of feeling profound,” said the Rev. Chuck Robertson, canon to the presiding bishop for ministry beyond the Episcopal Church. Robertson was part of the American delegation that traveled to Zimbabwe for the Mizeki festival. Mizeki was born in Mozambique in the mid-1800s. As an adult working in South Africa, he became a Christian in 1886 and helped translate Anglican sacred texts into African languages. Then from 1891 until his death in 1896, he served in what is now Zimbabwe as a missionary who converted many of the Mashona to Christianity. Although Mizeki became well-versed in the local language and was sensitive to the Mashona’s spiritual traditions, his missionary work angered some African nationalists who saw such work as an extension of European colonial influence. He was speared to death outside his hut on June 18, 1896. Those on their way to help him reported seeing a great light and hearing the sound of wings. When they arrived, Mizeki’s body was gone. The annual festival in Mizeki’s memory regularly draws 20,000 or more pilgrims, and it is held not far from where he was killed 121 years ago. 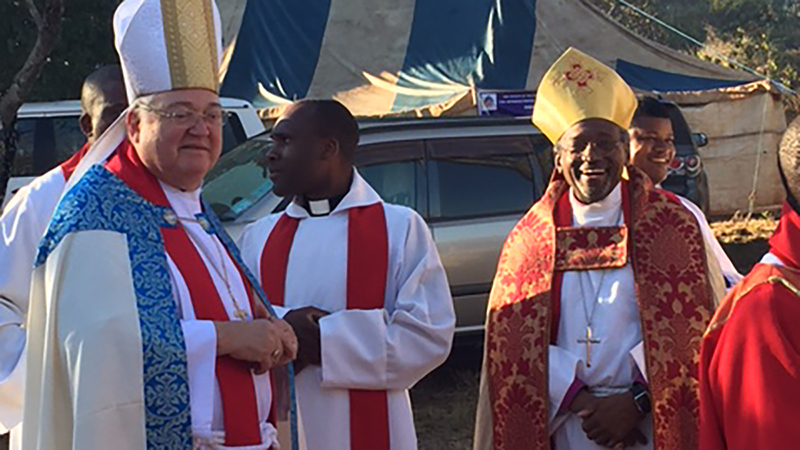 Lambert learned of the festival through Eau Claire’s companion diocese relationship with the Anglican Diocese of Harare, Zimbabwe. He journeyed to Harare for the festival for the first time in 2015, shortly before Curry was elected presiding bishop at the General Convention meeting that year in Salt Lake City. “I knew right then and there I’d like to have him in Zimbabwe to preach at the Mizeki festival,” Lambert told ENS. He posed the idea to Curry, who added it to his calendar for 2017. The service itself was celebrated on a grand scale, lasting more than two hours. 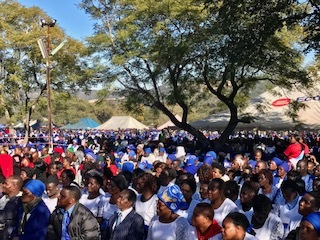 All 15,000 worshipers were able to receive the Eucharist through stations set up all around the field where the service was held, with Harare Bishop Chad Nicholas Gandiya presiding. Afterward, Curry joined a group of church leaders who planted trees nearby. Robertson said this was part of Gandiya’s initiative aimed at reversing the tide of deforestation in the region. “The presiding bishop and those of us who accompanied him gave thanks for the opportunity to witness and participate in an occasion that truly was a foretaste of the great heavenly celebration to come,” Robertson said. It was an honor, Lambert said, to have Curry join the American delegation on the trip this year. Fantastic! My deaconal ordination was on his feast day and he has become precious to me. Thank you Presiding Bishop Curry for your always inspirational sermons! I was ordained to the deaconate on the Feast of Bernard Mizeki in 2005. I have always celebrated this feast in thanksgiving of my ordination. What a blessing to learn of this celebration. Being an African-American priest, I considered it a blessing from God to have been ordained on Mizeki’s Feast day. It continues to remind me that our calling is one of service and when it gets difficult I often remember the sacrifice Mizeki made for the faith! What a wonderful story of God’s many blessings. Why didn’t you print the sermon so we also could hear Presiding Bishop Curry’s words ? Does the Presiding Bishop have nothing better to do with his time than jet-setting around the world at other people’s expense? It’s that “darned” Anglican Communion thing the Episcopal Church belongs to. it was really a blessing to have the Presiding Bishop as our guest preacher. His sermon will go down the memory lane for a long time. Itwould be a great advantage to have the text of Archbishop Curry;’s sermon, in print and audio-visual if there possible.